Before I started as a dealer in 2012(when I was 18 years old) I have collected many types of coins and banknotes. I collected things I liked because of their aesthetic value or their historical value. Of course, since I was a teenager, it was also important that I could afford the coins I wanted to collect. And this was, obviously, from time to time very frustrating. The first coins I started tot collect where Dutch coins from 1818 to 2001. The first foreign coins I collected were dollars from the USA. After a year of collecting dollars from the USA I decided to focus on Morgan Dollars. The Morgan dollar is named after the designer of the coin, George T. Morgan. 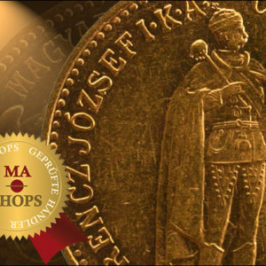 He was a great designer and made several beautiful coins. 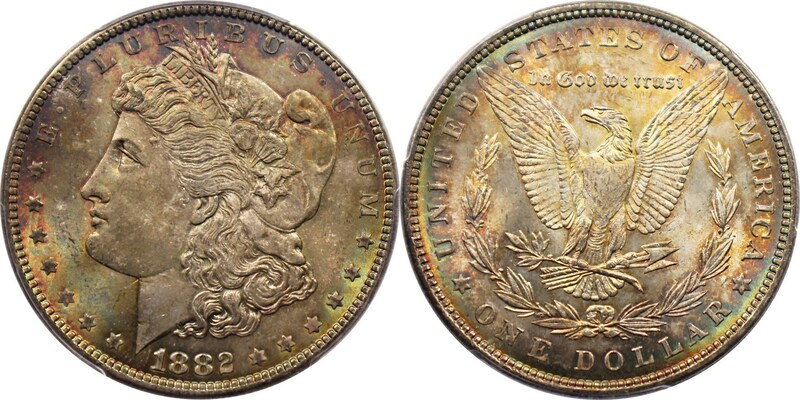 He is most famous for his design of the Morgan dollar, but he is also known for the design of the well-known Columbian Exposition half Dollar who was minted in 1892 and 1893. This was the first commemorative coin that the USA minted. 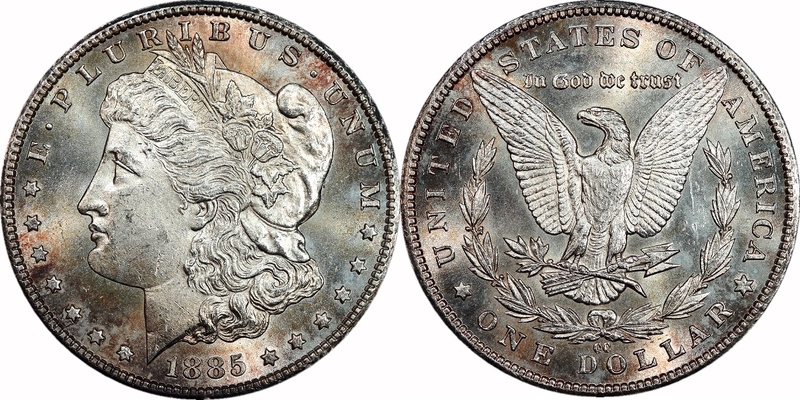 The iconography of the Morgan dollar is typically American. On the observe you can see the head of Liberty and the latin text E pluribus unum (One out of many). On the reverse you can see an eagle clasping an olive branch and arrows. The reverse has the texts: UNITED STATES OF AMERICA, ONE DOLLAR and In God We Trust. 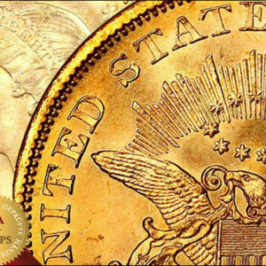 The quality of the coin his design is very high and is, as mentioned before typical American. I think there for the popularity of the coin is so high. 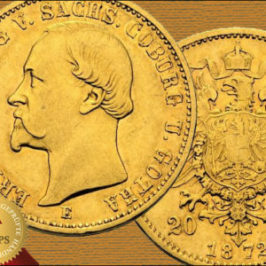 The 1895-O is one of the most popular key dates in the Morgan series. 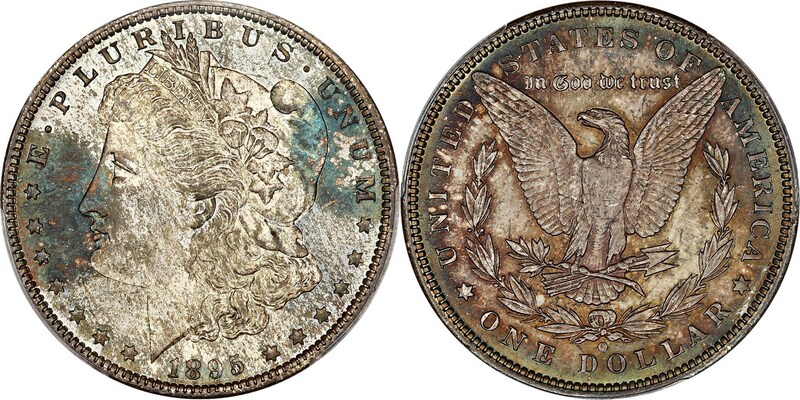 An incredibly fresh and original coin it is one of only 3 graded MS66 by PCGS, with only 1 grading higher at MS67. Dark bluish-gray tints from original album tones cover both sides of the coin with an overall pleasing appearance. Tailbar, VAM-4, Top 100. Exceptionally nice with wonderful surfaces, uber frosty with great cartwheel luster, well struck and absolutely undipped, original white. A primo example of this Top 100 variety. 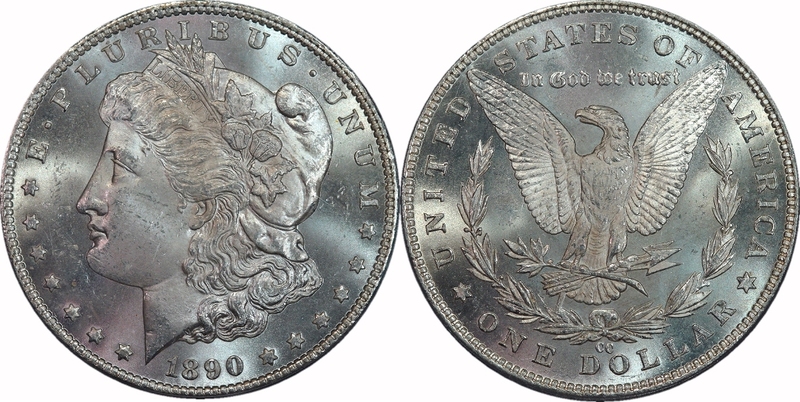 The Morgan dollar was minted between 1878 and 1904 and in 1921. The dollar has a mass of 26.73g, a diameter of 31.1mm and a thickness of 2.4mm. The edge of the coin is reeded and the composition of the alloy is 90% silver and 10% copper. The Morgan dollar is minted in several mints. 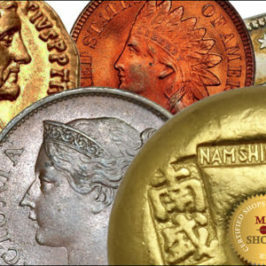 They were minted in Denver (mintmark ‘’D”), New Orleans (mintmark ‘’O’’), San Francisco (mintmark ‘’S’’), Carson City (Mintmark ‘’CC”) and Philadelphia (no mintmark). You can find the mintmark beneath the centre of the wreath on the reverse. 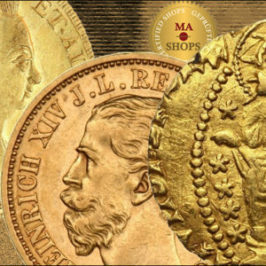 It is well known that the coins from Carson City have a higher value. Collectors collect Morgan dollars in different ways. 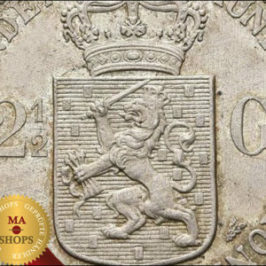 It is very common that they collect by year but since two decades it is also very popular to collect them on quality (And that can be seen on the basis of the price ). 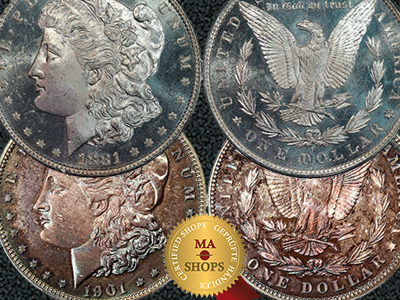 MA-Shops offers a nice diversity of Morgan dollars on their website. 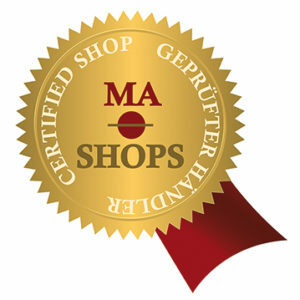 MA-Shops makes it easy to buy from USA traders who have normally the best USA dollars. This make it easier to collect these coins from other parts of the world.